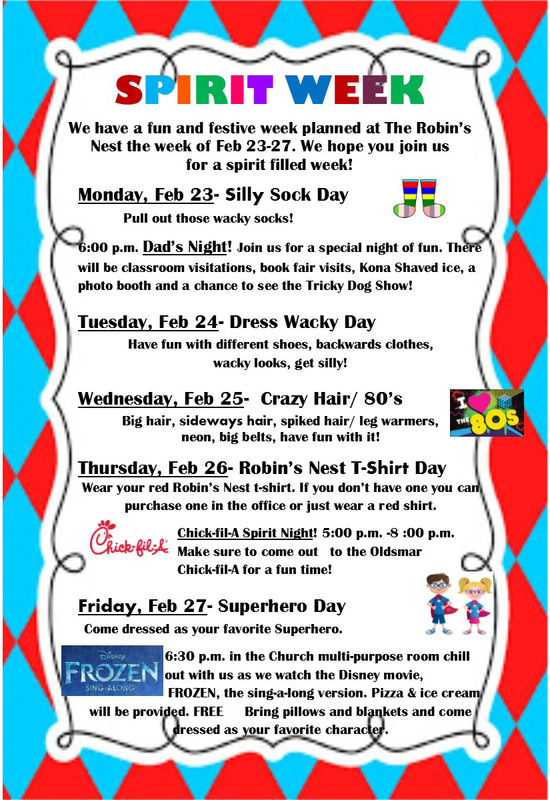 Robin’s Nest Spirit Week Starts Monday! for a spirit filled week! Pull out those wacky socks! 6:00 p.m. Dad’s Night! Join us for a special night of fun. There will be classroom visitations, book fair visits, Kona Shaved ice, a photo booth and a chance to see the Tricky Dog Show! Have fun with different shoes, backwards clothes, wacky looks, get silly! Big hair, sideways hair, spiked hair/ leg warmers, neon, big belts, have fun with it! Wear your red Robin’s Nest t-shirt. If you don’t have one you can purchase one in the office or just wear a red shirt. Chick-fil-A Spirit Night! 5:00 p.m. -8 :00 p.m.
Make sure to come out to the Oldsmar Chick-fil-A for a fun time! Come dressed as your favorite Superhero. out with us as we watch the Disney movie, FROZEN, the sing-a-long version. Pizza & ice cream will be provided. FREE Bring pillows and blankets and come dressed as your favorite character.